Lorna Sakalovsky, in keeping with her international reputation for excellence, has created two exceptionally brilliant collectable chess sets. Lorna's special gift for capturing in ceramics the drama and humour of life is utilised to the full in these beautiful chess sets. 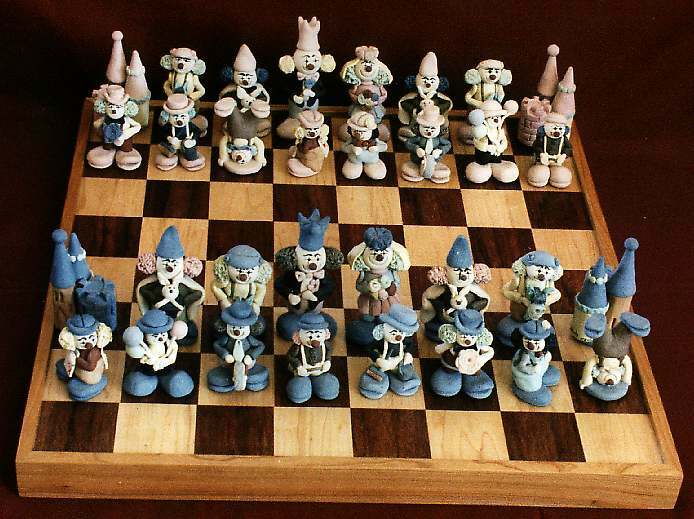 These exclusive ceramic chess sculptures are commissioned personally by you. Lorna makes each set individually by hand, guaranteeing that your collectable will increase in value over the years. The Clown Design adds just the right touch of gentle humour to the drama of the chess game. The great intellectual battle that rages on the chess board is tempered by the wittiness of the clowns. Their meek and charming appearance is in dynamic contrast to the military role they are required to play on the chess board. 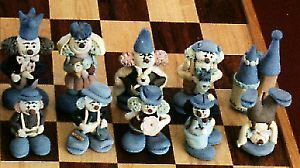 You can own a unique Clown Chess Set of the Lorna Sakalovsky Collection, a chess collector's pride. The chess pieces are finely crafted in exquisite detail by Lorna Sakalovsky herself from variously tinted fine porcelain clays. The exquisite display chess board is handmade of exotic woods to complement the high quality of the ceramic pieces. These rare whimsical sets are on outstanding addition to any collection. 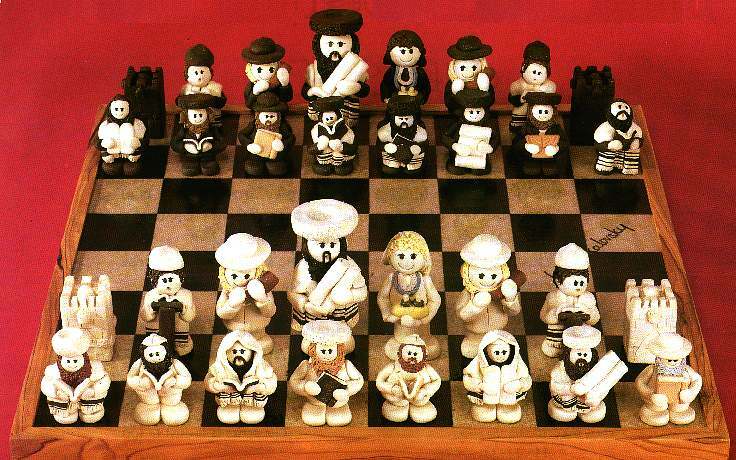 The Rabbis Design brings the tradition of fine Judaica to the world of the collectable chess set. Lorna's sensitivity and broad knowledge of Judaism, coupled with her universally acclaimed talent, have once again produced an exquisite ceramic sculpture. Rabbinical scholars have always been drawn to the game of chess. The battle of wits that the game creates suits well the Talmudic style of debate. On an even more profound level, the game has always appealed to the Jewish people. Chess reflects the struggle of good and evil in the world and teaches that victory comes to the one with the broadest view of events and the clearest goals. 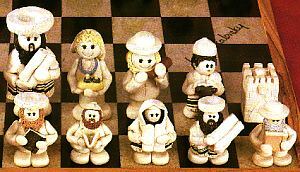 The Rabbis Chess Set is created from the same high quality porcelain clays as the Clown Chess Set and comes with the same handmade display chess board. Clicking on the above photos will show a full screen picture of each chess set. Dimensions: Pieces height: 5 to 8 cm. Board: 43 x 43 cm.